Questions are sometimes hotly debated in archaeology until new discoveries shed light on the topic and change everything. During the 19th century, the primary question in American archaeology concerned the origin and demise of the people that built the mounds throughout the Americas. To the public and scientists alike, the builders could not have been the ancestors to the modern "savages." At the end of the century, new discoveries that the Mound Builders were ancestral to the modern native peoples; however, the time and place of their origin remained a mystery. Into this vacuum and in competition with their European counterparts, American archaeologists sought to build a deep prehistory for the wester hemisphere. They failed, and the question of the origin of Native Americans loomed. That changed in 1919 when a cowboy noticed a pile of bones in an arroyo in northern New Mexico. George McJunkin was a former slave who had educated himself about natural history, and he knew that these were no ordinary bones, they were Pleistocene age, and with them was evidence of humans-ancient spearheads! With this seemingly simple discovery, Paleoindian archaeology came into existance. Forty years after McJunkin discovered extinct bison bones in New Mexico, a site in southeast Wyoming would once again significantly change our understanding of Paleoindian archeaology. 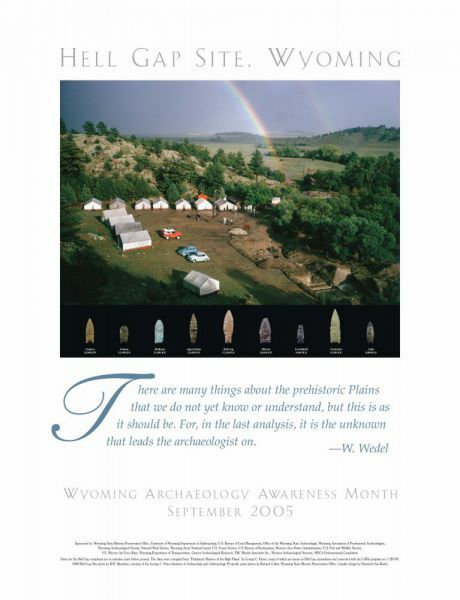 James and Otto Duguid, and Mel and Bob McKnight, avocational archaeologists form Wyoming , and two of them University of Wyoming students, discovered several unusual spear points. They showed these points to George Agogino, Ph.D., James Duguid's professor at the University of Wyoming who recognized them as Paleoindian, but of an unknown type. Agogino dispatched students to test the site and a stratified series of cultural occupations was recognized throughout the arroyo (the section wall is visible in the poster). The unknown type of projectile point was found in stratigraphic position relative to Folsom, Agate Basin, Eden, Scottsbluff, and Alberta, all previously recognized Paleoindian complexes. The chronologcal relahonships of these complexes, however, were not clear in 1959; and the potential of the site to provide this information and thus begin linking sites throughout North America in time and space sequence was enormous. The unknown projectile point and the site were named Hell Gap, after a local landmark. Following the first tests, a team that included Agopo, John 0. Brew, Cynthia Irwin, Henry Irwin, and C. Vance Haynes Jr., all later well-known Paleoindian archaeologists, excavated the site from 1962-66. Not only did Hell Gap fill the chronological gap by revealing the temporal sequence of Paleoindian cultural complexes, but three new complexes were defined: Goshen, Hell Gap, and Frederick. The site also is important in that the archaeology revealed many social and cultural aspects about Paleoindian lifeways. Hell Gap was a campsite, or living area, whee these cultural aspects are more easily determined. Until the Hell Gap discovery, almost all known Paleoindian sites represented bison procurement locations-a highly specialized part of the total lifeways. Bison kill sites do not provide the type of cultural information that was fomd at the Hell Gap campsite. At Hell Gap, a series of archaeological layers were exposed with a wide variety of stone tools, production debris, animal bone, stone and bone ornaments, bone tools (including needles), hearths, and domestic living structures. Domestic or living structures older than 12,000 calendar years were recorded at the Hell Gap excavations. These appeared as a circular pattern of postholes, showing a formalized construction process. Forty years later, these are still among a handful of the oldest structures in the Americas. A 9,000-year-old stone circle was also found in the Fredrlck component at Hell Gap. In more recent sites, such stone circles are recognized as evidence of that quintessenhal home of Great Plains Indians: the tipi. At the same time, people associated with the Frederick complex were wearins bone and stone bead ornaments and eating a variety of animals. Not only did these earliest Americans subsist on resources other than bison, but they had a rich camp life. The Hell Gap window into camp life helps fill gap in knowledge about Paleoindian social and cultural systems. The Hell Gap site has not yet given up all its secrets. Recent research at the site has begun to question the accepted Paleoindian cultural chronology and field studies by the George Frison Institute of Archaeology and Anthropology have identified additional Paleoindian components at the site. Hence, it is obvious many questions about Paleoindians and the Hell Gap site still remain. The unknown continues to lead the arcftaeologists on!